NEW YORK, New York, July 17, 2018 (ENS) – New York City is a magnet for America’s fashion designers, but fashion hasn’t been a feature in the sober halls of United Nations headquarters. That changed this week as the High Level Political Forum on Sustainable Development held its annual meeting there. 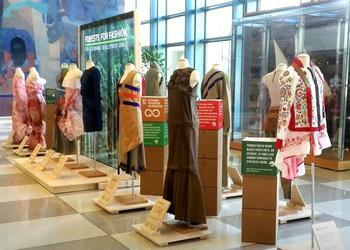 A fashion exhibit at the Delegates Entrance and in the Secratariat Lobby of the UN building showcases the work of many designers, all inspired to use forest-derived materials for their creations. Information on the links among between forests, fashion and the Sustainable Development Goals, SDGs, is part of the show. In an attempt to steer the global fashion industry onto a more sustainable path, 10 different UN organizations got together at the Forum and agreed to establish a UN Alliance on Sustainable Fashion. The side event was hosted by the UN Economic Commission for Europe, UNECE. The fashion industry has seen a spectacular growth in the early 21st century. UNECE data shows it is now valued at more than US$2.5 trillion and employs over 75 million people worldwide. Despite an increase in jobs, this development comes at a price. The current state of the fashion industry can be described as an environmental and social emergency. Nearly 20 percent of global waste water is produced by the fashion industry, which also emits about 10 percent of global carbon emissions. The textiles industry has been identified as a major contributor to plastic entering the ocean, which is a growing concern with negative environmental and health implications. 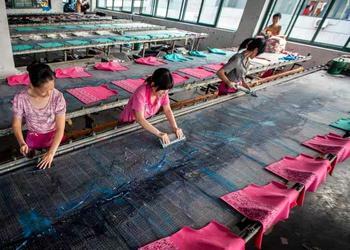 Fast fashion also is linked to dangerous working conditions due to unsafe processes and hazardous substances used in production. 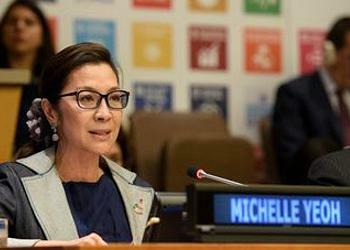 Malaysian-born film star and UNDP Goodwill Ambassador Michelle Yeoh, a sustainable fashion champion, opened the Forum’s Ministerial Segment on Monday, and launched her new video “Made in Forests,” a sustainable fashion story. One answer: high-fashion produced with certified sustainable new generation forest-based fabrics. Following Yeoh on her journey to find an outfit that does not harm the planet, the video takes us to Italy’s Cittadellarte Fashion B.E.S.T. – an art foundation that promotes sustainable fashion design through art and education. Here young design talent Tiziano Guardini creates a beautiful dress for her entirely made of certified sustainable wood-based fibres. Michelle wore the dress in New York today at the launch of the movie. “Given its ecological footprint, today’s fashion is an environmental emergency,” said Algayerova. “We need to move from a fashion sector with a high impact on the planet to one that is inspired and uses natural resources sustainably. Forests can help this transition. Generally, the Earth’s forests are doing better these days, according to the UN Secretary-General’s most recent report. Still, the UN is committed to changing the path of fashion, reducing its negative social, economic and environmental impact and turning it into a driver for the implementation of the Sustainable Development Goals. UN Environment will host the UN Alliance on Sustainable Fashion during its first year, and will formally launch it at their next Environment Assembly in March 2019. The High-level Political Forum, the UN’s central platform for follow-up and review of the 2030 Agenda for Sustainable Development and the Sustainable Development Goals, provides for the full and effective participation of all States Members of the United Nations. “The 2030 Agenda is our roadmap and its goals and targets are tools to get there,” said Guterres. During the Forum’s ministerial meetings, which conclude Wednesday, 47 countries are carrying out Voluntary National Reviews of their performance on all sustainability metrics, not just those from the fashion industry. An outcome document will be released on July 18. On July 10, the Chapman Perelman Foundation and the New York Academy of Sciences sponsored the Change Fashion Forum and Workshop in tandem with the Forum’s emphasis on sustainable fashion. The event gathered leaders from the fashion industry, academia, and nonprofit organizations to begin the development of a prioritized sustainable fashion research agenda and roadmaps for the priority areas identified in the agenda.